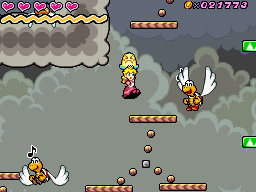 Giddy Sky 7-3 is the third level of Giddy Sky in Super Princess Peach. The level starts off near a Calm Amazing Flyin' Hammer Brother and some platforms with Ravens on them. At the end of this section is the Warp Pipe. In the next area, the player needs to cross some more platforms, before getting to a structure made up of blocks. Past this structure are three Warp Pipes that spawn Goombas, and past that is a rotating platform that leads to the next Warp Pipe. The next part of the level is autoscrolling, and the player will need to avoid a Calm Lakitus before getting to the Warp Pipe. The next room has some rotating platforms that need to climbed to get up the level. At the top of the level is a small section, with a yellow cloud blocking a Toad, and a ladder to get to the Warp Pipe. In the next room, the player needs to drop down to find a Puzzle Piece, and then get to a hot-air-balloon, that is powered by Princess Peach's Rage vibe, that leads to the next Warp Pipe. In the next room, the player needs to cross various platforms before getting to the next Warp Pipe, and the player can spin a windmill to rescue a Toad in this room as well. In the next area are some Red Paratroopas, and some platforms that have Ravens and Sad Ravens on them. The player will need to climb up these platforms before getting to the next Warp Pipe. The next area has a Chain Chomp before the goal gate.